P.S.....after the Ocean Spray low tech feeding apparatus was removed. Very nice Frosty. Not many things as nice as a fully expanded sun. I use a mix of various meaty frozen foods and by injecting it into the bottle at different angles it disperses all over the coral and nearly every head gets food. I feed daily so if a couple heads dont get fed today they usually get it the next day. 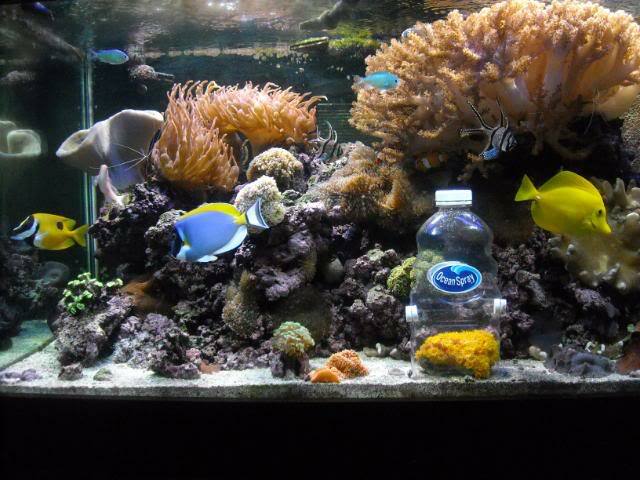 No, the sun coral is the only one that gets bottle fed and the lps just get a direct shot from the squirt feeder and the rest draw from whats floating in the water column. Looking for the bright orange/yellowish orange one's anywhere that might have this? any other colour's you have seen that are as nice as those? 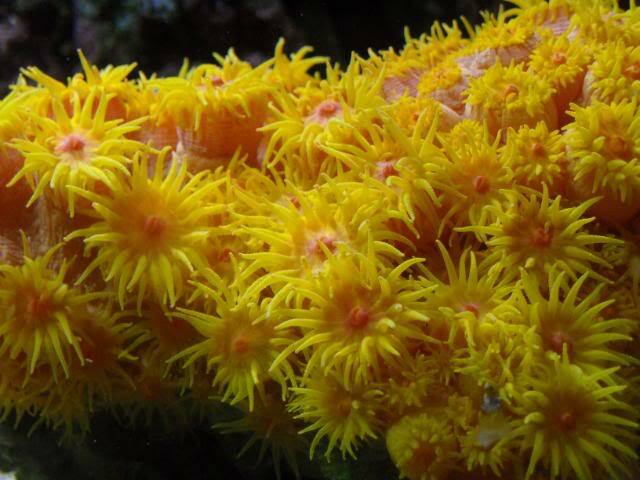 My sun coral came from NAFB in Scarborough and they had bright orange, bright Yellow and a few shades in between. They have the best selection of Sun corals in the GTA. what's the min/max period of time you leave the ocean spray container on for? Is there a hole in the top? Yes there is a hole in the top where I inject a combination of mysis, blood worms and a bit of frozen cyclop-eze bar. I put the bottle over the sun coral when it starts to open and at the same time I thaw the food which happens quick. Then I give it a short squirt of the mixture to coax him to expand fully which takes about 15 minutes. then I give it a big squirt to try and allow all the mouths to get some food. it usually takes another 15 minutes for them to eat it all at which point I give it a second big squirt which takes another 15 or so minutes to consume. the whole feeding lasts 45 to 60 minutes but only requires 5 minutes of my attention to inject the food. When all traces of food are gone I remove the bottle so the inverts and my yellow tang dont bug the sun coral for the leftovers. holes on the side too? those just for a little flow or ? I personally dont have any holes in the side but a friend of mine does have holes in his feeder because he can be forgetfull and once forgot to remove it before he added the holes and his suncoral suffered a fair bit of damage since he left the bottle over it for 18 hrs with no flow. the only thing on the side is white plastic covered magnets for weight to keep the bottle from floating and moving. I see makes sense where you get the mags? I get them from mops.ca which is an online retailer but is located in Hamilton Ontario, so only a short drive away from my house and they allow walk in customers to their warehouse facility. Thats what they are actually for. My tank is 1/2" glass and I was using them for an eggcrate frag rack. I siliconed them to the eggcrate but that only held for three weeks before it let go. I was going to try and super glue them but my fish kept pulling the frags out of the rack and tossing them in the rocks so I made a box out of eggcrate to fix that. Now I just hang it off a pipe from my closed loop that runs along the side of my canopy to feed the front of the tank. 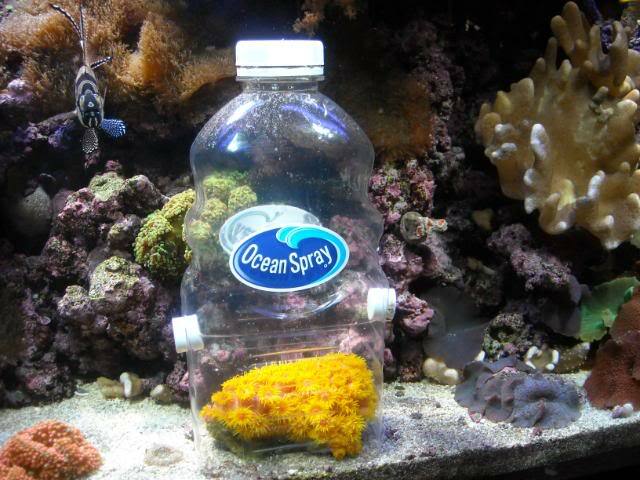 some people use them as frag plugs to secure corals to overflows and the glass. They have quite a powerful pull to them. do you think they ship? Yes they will ship. Mops stands for Mail Order Pet Supplies. 95% of their business is shipping product all over north america. They also have a USA shipping outlet in NY State. They are great people to deal with. They have on many occasions brought in items for me that they dont normally stock. All it took was a simple request. If they dont have what you want, call them and talk to Dan the owner and I'm sure he can help you out.